A basic use case for our updated Automations feature. Welcome emails are a commonly used method for introducing either a new customer or a promising lead to your product. 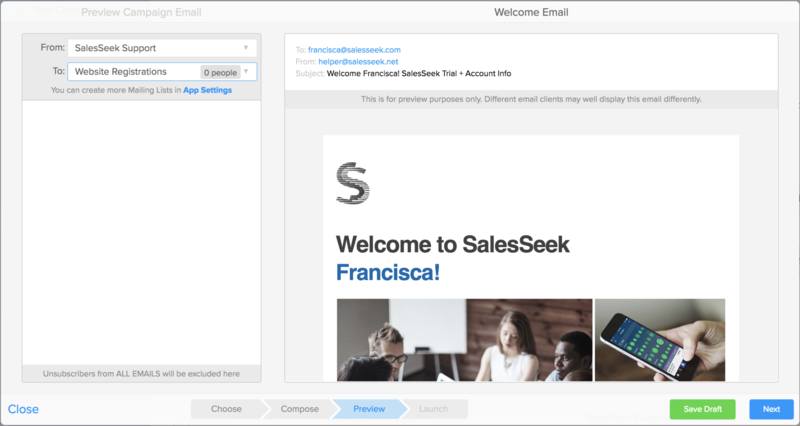 With making a good first impression key in the on-boarding process of new clients, this initial email interaction is very important. However, if your company deals with a large number of potential/new clients on a daily basis, the process of sending out personalised Welcome Emails can be heavily time consuming. Follow the simple steps below to automate your entire on-boarding process, significantly reducing your sales team’s workload. You know your customers better than anyone. 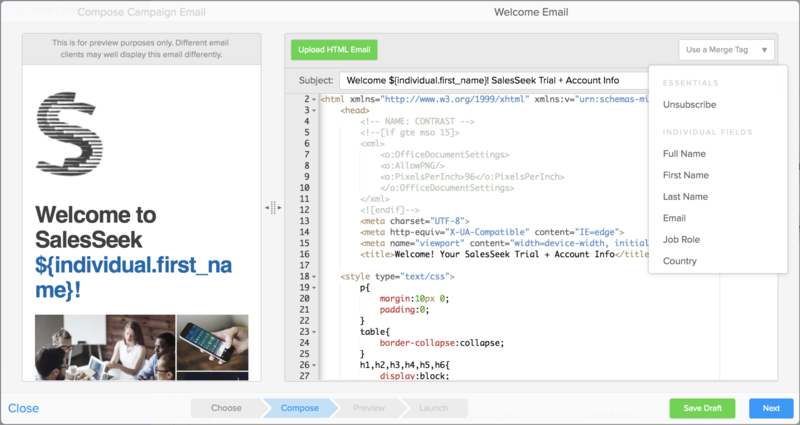 Using your insider knowledge, decide at which point in your customer journey you want the automated email to be sent. Check our 'Automations 2.0 Fundamentals' article to check which events can trigger an Automation. In the example given within this article we want the email to be sent to all customers who register on the company's website. 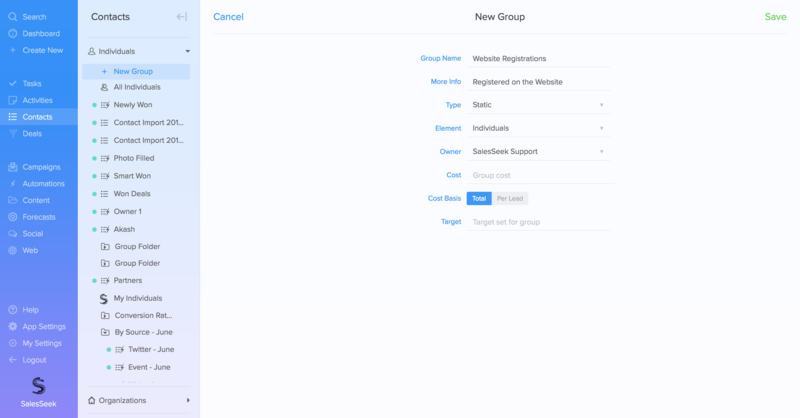 Navigate to Contacts > Individuals > Select: 'New Group' > Give your Group a Name > Ensure the group Type is 'Static' and the Element is 'Individuals'. 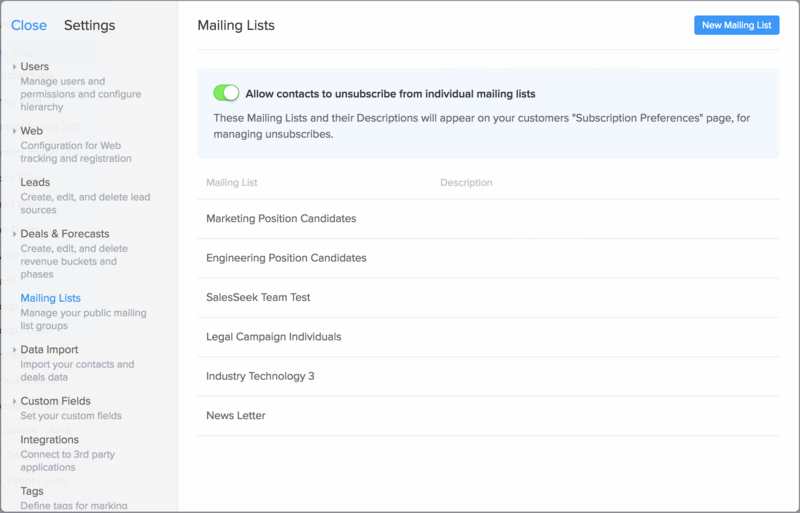 > Select 'New Mailing List' at the top right of the window > Select the desired static group which you created earlier and then Save. Click on 'New Campaign' within the Campaigns section of SalesSeek. Welcome Emails will likely be created using HTMI, select the 'Campaign Email' option highlighted below. > In the Compose stage you will be tasked with designing your email. To personalise the email for the recipients, use Merge Tags which are offered in the drop down window towards the top right. > After pressing 'Next' you will be able to Preview the email. At this stage you will need to select the Mailing List which you created earlier in the 'To:' dropdown. > Save the campaign as a draft. 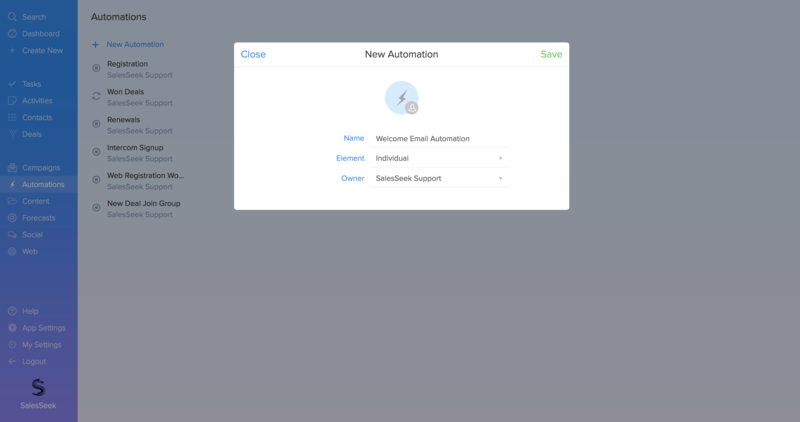 Create a 'New Automation' in the Automations section. > The Element should be 'Individual' - you can learn more about Elements in our 'Automations 2.0 Fundamentals' article - and status should automatically be set to 'Off'. Create the first stage of the new Automation. The first stage should relate to the Event which triggers the Automation. In this example it would be the web registration. 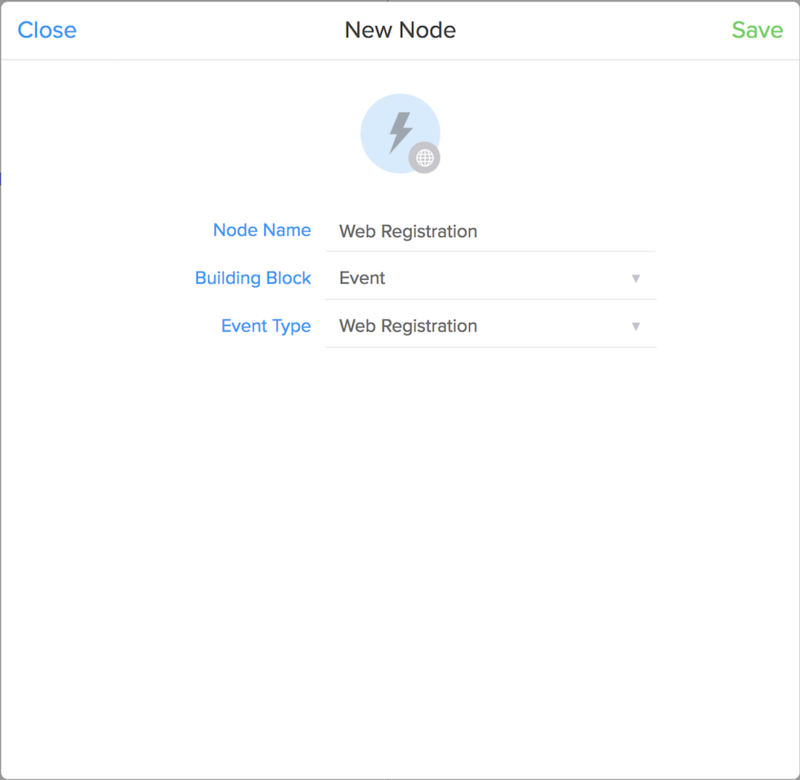 Press the plus sign under start to add this first Node > In our example the Building Block will be 'Event' > 'Web Registration' should be selected as Event Type. 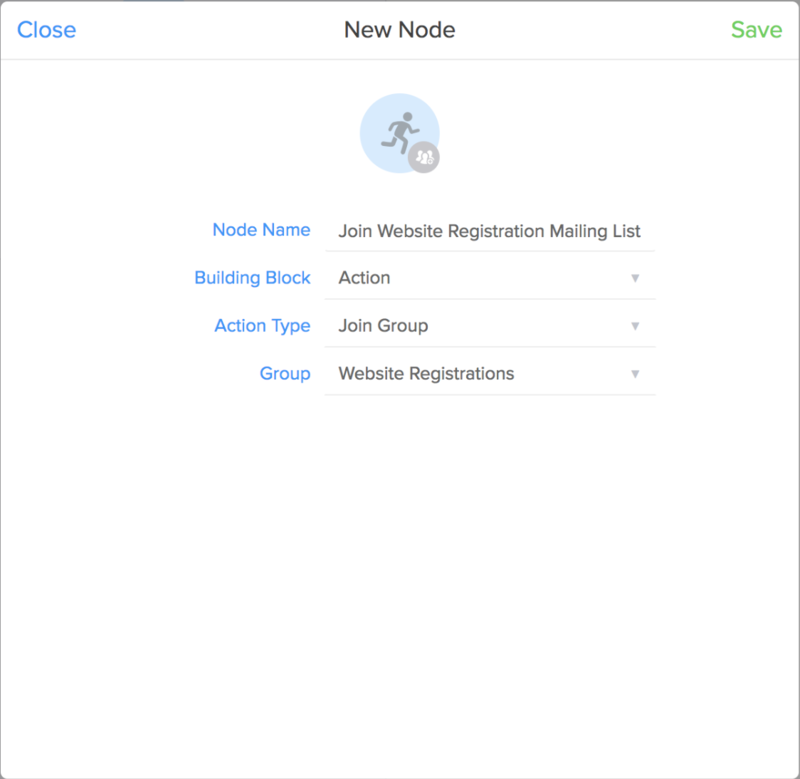 The next Node should trigger anybody that registers via the website to be put into the Static group/Mailing List that we created. Therefore, the Building Block should be 'Action' > Action Type 'Join Group' > Group should be our Mailing List. Create a new Node to make sure all individuals within the Mailing List are sent the Welcome Email Campaign. 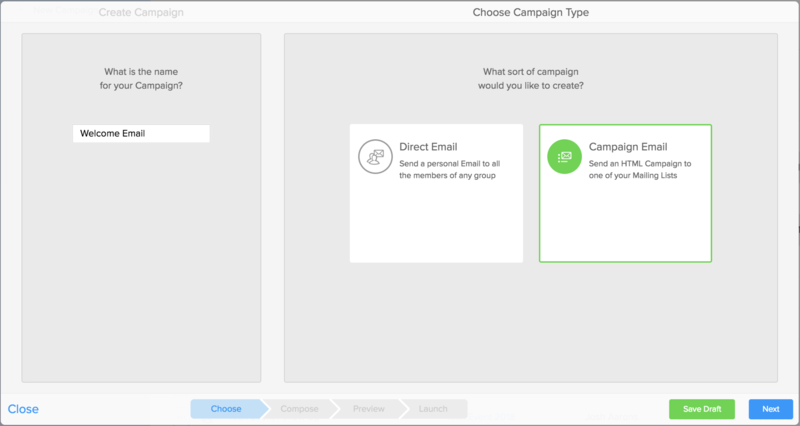 This is done by making selecting Building Block as 'Action' > Action Type as 'Send Campaign' > Select your Welcome Email Campaign in the bottom drop down menu. 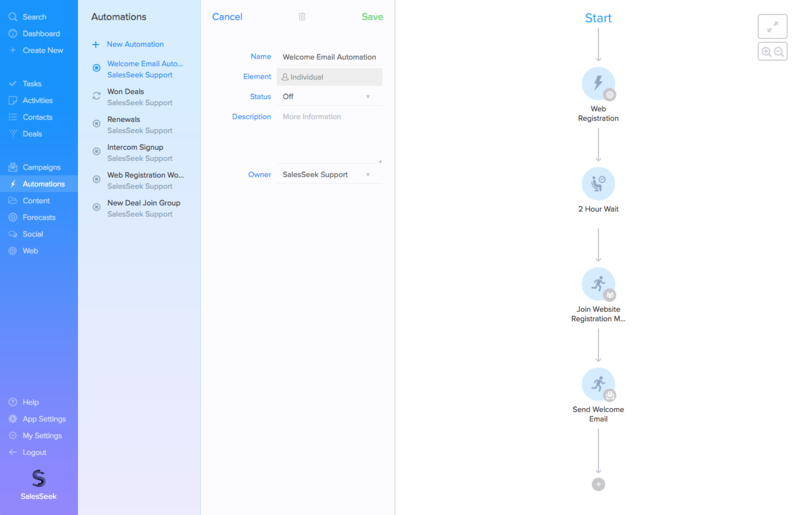 An optional step would be to introduce a Wait building block to create a delay between an individual registering and the email being sent to them. 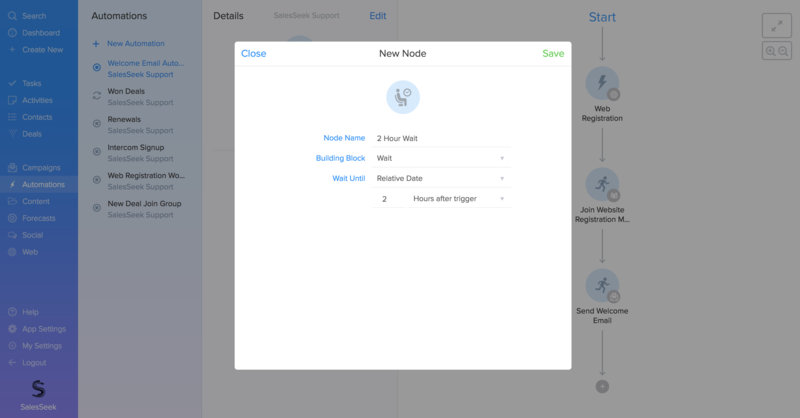 To do this, create a new Node between the first Event Node and the first Action node. If you hover above the downwards pointing arrow between two Nodes, a plus sign should allow you to add to the Automation. A 'Wait' Building Block can either be set to wait for a relative amount of time - as seen above - or can be set to delay the process until a specified date. Once you've checked your Welcome Email Campaign and made sure that you're happy with the Automation, you can activate the sequence by changing the status of the Automation from 'Off' to 'On'. From that point on, anyone who registers on the website will be sent an automated Welcome Email after a two hour delay. If you have any questions regarding Automations, please feel free to get in touch with the team.